today I was surprised by seeing a man on a little wooden seat dangling outside my window using a suction cup to hang on to the window. We were supposed to take out all our screens on the lower half of the window but we have 25 window screens that are over 3 feet tall with screws in the top sill and most are about four feet away from the floor, except for 6 that are twenty feet off the floor. The management said that we could have one of the maintenance guys remove them for 10 bucks a screen. $250 for clean windows? We are just going to have dirty lower windows until next year when the boxes and my dismantled sewing table are no longer blocking the windows. 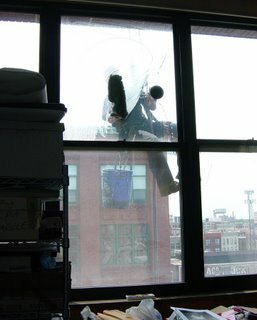 Wow, I've seen movies with the windown cleaner dangling down cleaning windows in tall buildings. Interesting to a country girl! $10 a screen...way too much!! Came across your blog today and wanted to write to tell you that I love your work. 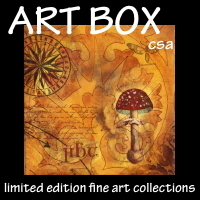 Your art quilts are just amazing ! Wow from me also. How are you supposed to get the screens off? But it's great that the windows open. Very cute box design by your daughter.